High cholesterol is a place of concern for many people. There are surprisingly simple ways to positively influence the body’s cholesterol levels through diet. Here you will find all you need to know about the basics of cholesterol, what is does in the body, and the ways to influence the body’s cholesterol through diet. Cholesterol is a chemical structure in the body that acts as the foundational structure for all steroid derivatives made in the body. Steroid is the true term for hormones, like cortisone, aldosterone, testosterone and estradiol. The body needs cholesterol as a base to build each of the hormones, bile acids and vitamin D. Cholesterol is a natural and important part of our body’s chemistry. In fact, our body makes all the cholesterol it needs on its own and is not necessary to get from dietary intake. Cholesterol levels can elevate in the blood and prolonged periods of high cholesterol can lead to coronary heart disease. Most cases of high cholesterol are caused by an unhealthy dietary intake of cholesterol containing foods and a small percentage of cases are due to genetic predispositions to high cholesterol. Because many of these cases are related to diet, diet can be a simple way to combat high cholesterol and bring blood levels down to a healthy amount. Typically doctors write prescriptions for drugs to lower cholesterol levels rather than educating patients on how to change their diet. There are five classes of drugs prescribed for high cholesterol, and the first class of drugs are “bile acid sequestrants such as cholestyramine (absorbs bile acids)” (1). Conveniently, there is a nutrient called fiber, that just so happens to lower cholesterol in essentially the same way. Wouldn’t it be nice if you went into see you doctor and instead of a prescription with multiple side-effects, your doctor gave you instructions for a health diet modification? Fiber binds to bile acids in the digestive tract, and once the bile acids are bound to fiber the bile acids cannot be used in other ways in the body, such as fat digestion. Then the bile acids are excreted from the digestive tract with the rest of the food waste. Bile acids are made in-part from cholesterol molecules in our body. By excreting out bile acids, the liver recognizes a depletion in bile acid and produces more bile acids to replace what it has lost in digestion, therefore using extra cholesterol molecules for production and subsequently lowering blood cholesterol levels. Fiber is also used by the good bacteria in our gut. Bacteria in the colon ferment fiber in order to produce acetate, proprionate, and butyrate, which inhibit (i.e. prevent) cholesterol synthesis. By preventing the production of new cholesterol in the body, fiber prevents the cholesterol levels from elevating further. There are two types of fiber, soluble and insoluble. Insoluble is the “woody” components of fiber, called cellulose and lignin, which have wonderful benefits for intestinal and overall health, but is not correlated with cholesterol lowering abilities. However, soluble fiber is the component of fiber that influences cholesterol levels, especially the lowering of total serum cholesterol and LDL cholesterol. Soluble fiber is the “fluffing” components of fiber, including pectins, gums, mucilages, algal polysaccharides and some hemicelluloses, typically found in fruits, vegetables, legumes and whole grains. 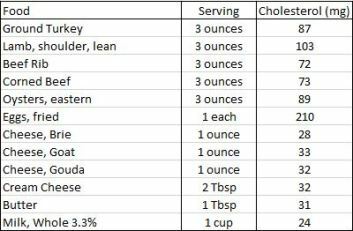 Cholesterol is only found in animal foods, including meat, milk, cheese, eggs and organs. In addition to eating a diet rich in fiber, consuming less animal products can also aid in lowering cholesterol levels by decreasing the consumption of unnecessary high cholesterol foods. A diet rich in high fiber foods can result in a 40% decrease in risks of coronary heart disease (3), and has many other health benefits. All fruits and vegetables are great sources of fiber. The chart below lists a few of some of the highest fiber foods available. It is wonderful to know that such a simple diet change can have such a profound impact on your health and cholesterol levels. Cook black beans according to instructions, or use rinsed, canned black beans. Steam sweet potato until barely soft to the center. Cook quinoa in 1 cup water. Dice all ingredients into small cube size pieces and slices. Mix together in a large bowl. Add sea salt and pepper to taste. Mahan LK, Escott-Stump S, Raymond JL. Krause’s Food and the Nutrition Care Process. 13th St. Louis, MO. Elsevier; 2012, 46, 757. Gropper SS, Smith JL. Advanced Nutrition and Human Metabolism. 6th Belmont, CA. Wadsworth; 2013, 120. Petrisko Y. Cardiovascular Disease Lecture. Medical Nutrition Therapy I. San Diego State University. Lecture Conducted November 14, 2013. McGuire M, Beerman KA. Nutritional Sciences From Fundamentals To Food. 2ndBelmont, CA. Wadsworth; 2011, 136, 152. McGuire M, Beerman KA. Table Of Food Compostition For Nutritional Sciences From Fundamentals To Food. 2nd Belmont, CA. Wadsworth; 2010.